Shrimp sautéed in garlic butter is a gourmet dish that you can pull together in 30 minutes or less. Make this recipe on those nights when you're tempted to head out for fast food after a long day or when you just don't feel like cooking. You can easily make shrimp in garlic butter sauce in under half an hour. It's a great way to create a dish that tastes fancy with a minimum of fuss. First, assemble the ingredients. The recipe below calls for precooked shrimp so that it's easy and fast to make. You can always purchase fresh jumbo shrimp. If you choose to use fresh jumbo shrimp, peel and de-vein the shrimp first before cooking it. 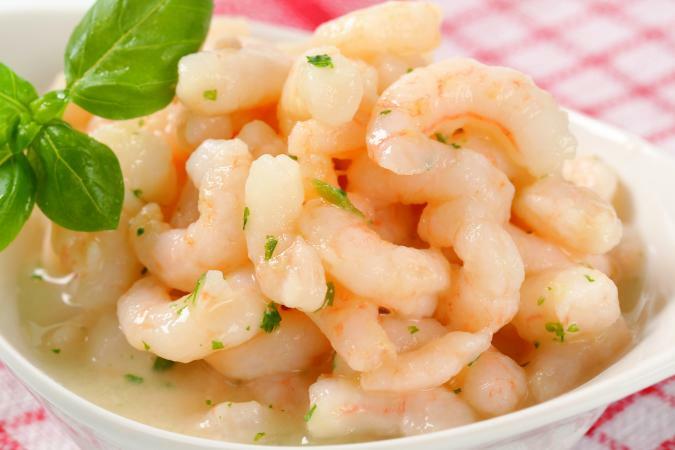 Look for precooked shrimp in the frozen foods section of your supermarket. Often advertised as salad shrimp, the pieces are smaller than the big, juicy shrimp you find at fish markets, but since they are precooked they can be thawed and used very quickly. They're ideal for the speed version of this recipe. Fill a pot about halfway with water and bring to a boil. Once it boils, shut off the heat source. If you're using an electric stove, remove the pot from the stove. Carefully place the frozen shrimp in the pot and simply let it stand on the stove. Be careful that you don't splash yourself with the boiling water. The water will thaw the frozen precooked shrimp. Remove the skin from the garlic clove, and using a sharp knife, very carefully cut the cloves into thin slivers. Set aside. Heat the butter in a saucepan large enough to accommodate the shrimp, and when the stick of butter melts into a golden pool, add the garlic. Sautée gently for about a minute, then add the thawed shrimp very carefully. Use a slotted spoon to get the shrimp out of the water - do not add the thawing water. Watch that any water droplets from the shrimp hitting the butter don't splash you with hot butter. Squeeze a bit of fresh lemon juice into the sauce, taste, and add more as you prefer. Now quickly sautée the thawed shrimp, butter sauce, and garlic until the sauce bubbles a bit. Sprinkle with parsley, salt and pepper to taste. Serve the finished shrimp recipe over white or brown rice. Before starting the sauce, set a pot of rice to cook. About five minutes before the rice is supposed to finish cooking, begin the butter sauce. You can serve the rice in a separate bowl or spoon it onto plates, arranging the butter sauce and shrimp over the bed of rice. Spinach: If serving spinach, serve it plain instead of creamed or in its own sauce. Garlic butter sauce should be the focus of the dinner and creamed spinach or another butter sauce may be too heavy or oily. Tossed salad: A tossed salad tastes refreshing with shrimp. It's also easy to assemble if you use pre-washed and bagged salad. Tomatoes: A salad of fresh heirloom tomatoes and basil, drizzled with white truffle oil and a good balsamic vinegar goes well with this dish too. Many people use the term shrimp scampi to refer to any shrimp made with garlic butter, but the two recipes differ slightly. Shrimp scampi typically refers to an Italian recipe that does include shrimp, butter sauce, and lots of garlic, but also includes white wine. It's the white wine that designates the recipe as a scampi recipe; however, many other dishes can be cooked with a similar wine-infused broth and be called scampi. The simplest sauce omits the wine.